Centralia is a town in Pennsylvania in the United States, abandoned after a fire in a strip mine took hold and has continued to burn, beneath the borough, for several decades. This devastated place serves as the departure point for Pierre Seinturier’s imagination to invite us into a fantasy setting which, like a visual oxymoron, is nothing but a contrario luxuriance and greenery. The first works in the exhibition welcome the visitor with tight shots of hanging hands opposite a blank surface. The sepia tones and the surrealism of the scenes presented like a storyboard put Seinturier in the position of narrator at the beginning of a dark tale. The gallery’s spaces are then treated as an almost theatrical set, in which a set of panels—individual or conceived as polyptychs—represent a dense forest of warm colors and strong lines. The sculptures accompanying them take the form of cut tree trunks with a totemic appearance and serve as living spaces for his enigmatic characters and playlets. The large acrylic paintings surrounding them reveal nature without perspective or transparency, a succession of shots without vanishing point. Here the forest is used like a tool in order to explore the infinite possibilities of motifs and textures. By the superposing of flat planes of color and the repetition of lines, Seinturier looks back at his past years at the École des Arts Décoratifs devoted to learning diverse printing techniques. The superimposition of layers, treated like a succession of prints, allows the artist to rediscover the original motif through different approaches and to achieve the loosening-up of the gesture. The color palette so representative of Seinturier is deliberately compartmentalized here and offers a framed interpretation of each element. The forest mixes the verdant tones of the leaves with the brown hues of the earth blended in an ochre matrix that results and which recalls the network of underground embers that ravage the original site in eternal selfdestruction. The sculptures, treated in sepia, reveal figures and enable the characters to be isolated by relating them directly to the artist’s more personal world. In fact, we find here Seinturier’s familiar references and his characters who seem to have stepped right out of a 1950s film noir. Curvaceous women, guns cocked in hands ready to pull the trigger, cigarette smokers with delicate scrolls of smoke… Through these elements, the artist also brings out the ghosts of the inhabitants of this abandoned town and the nostalgia for a fantasized world which falls within the most classical American culture, going from the Far West to Terminator, via Seinfeld. 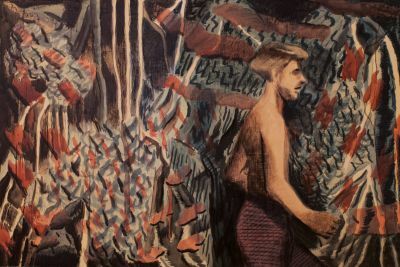 By using nature as a pretext to re-invest the motif and by placing the characters in the background, Seinturier no longer centers his oeuvre around narration and asserts his pictorial research. Through this exhibition, the artist makes us once again experience a journey into a fanciful and timeless universe out of step with all the proprieties of contemporary painting.